Do you idolize Sherlock Homes? When you were young did you run around your backyard in your deerstalker hat (that he never was described as wearing in Sir Arthur Conan Doyle’s stories, but was shown to by the artists of the time) brandishing your magnifying glass, shouting, “The Game is Afoot!”? Do you read the stories depicting his famous cases over and over again until you could repeat them by heart? Then to quote the man , “Eliminate all other factors, and the one which remains must be the truth.” Deduction tells us, this game is for you. 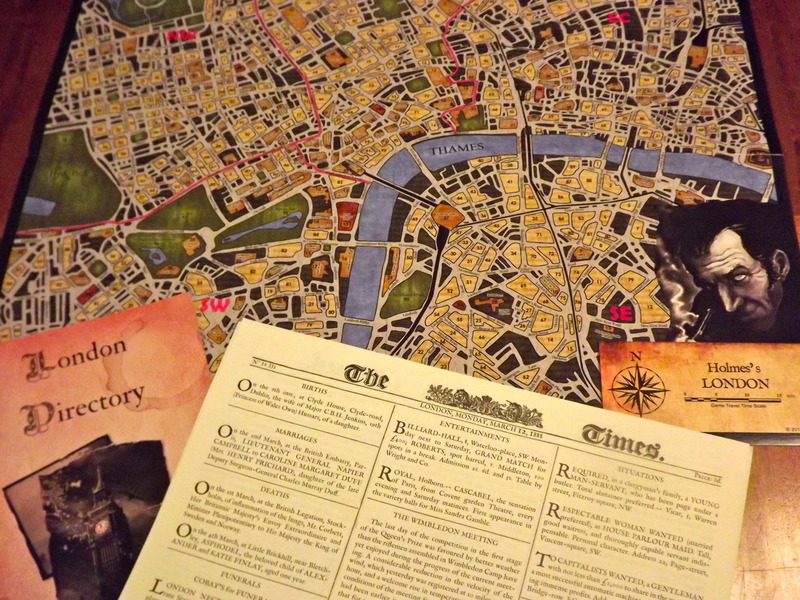 Sherlock Holmes Consulting Detective places you in the heart of London in a race to beat Holmes at his own game. Will you deduce the criminal before Holmes? Or will you be taught by the master himself to observe? Either way, this game will take your to your intellectual limits! The game itself is very easy to learn and teach. It is for 1-8 players, but there really is no reason why you cannot play with more. It can be played cooperatively to win against Holmes or competitively against both Holmes and your opponents! The game is played over a series of turns. The lead investigator chooses a clue to follow from the current case and finds the corresponding paragraph in the case book. They then read that paragraph out loud and notes that this lead has been followed. The player’s turn is then over and the case book is passed to the player on their left who becomes the new lead investigator. The players continue in this manner until they believe they have uncovered the solution to the dastardly plot. Once they have decided to stop following leads they can move onto the questions section of the case and match their solution to Holmes. This can be undertaken collectively as a group or the players can offer their solutions separately. The winner of the game is whoever has the most points after the solution has been revealed, or if the game is being played cooperatively, if you have followed less leads than Holmes! 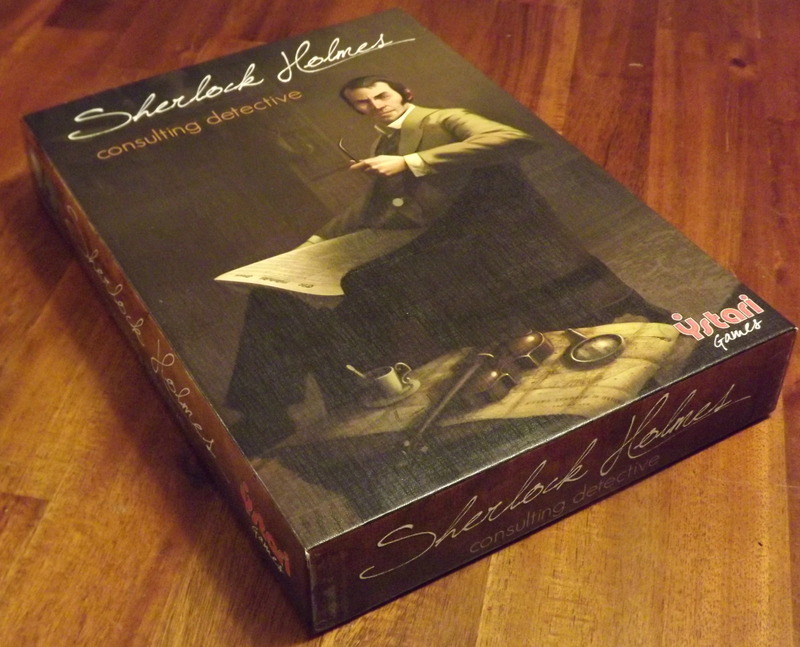 Sherlock Holmes Consulting Detective is an unusual game. It is more of a puzzle, or an event. It is an experience you won’t soon forget. When it comes down to it, it is best described as a mystery novel in a game. It is distilled pure deduction, without any fiddly pieces or cards getting in the way. The game itself can last anywhere between an hour and three, depending on how far down the deductive path you wish to go. Of course, the object of the game is to compete with Holmes by solving the mystery in the fewest number of clue points visited, but I found this to be an afterthought. My first instinct was to catch the criminals. If I happened to beat Holmes then it was icing on the cake, but the cake itself is where this game shines. However, the fact that you are trying to beat the master sleuth creates a lot of tension as you are playing out the cases. Since you gain points by answering the ending questions correctly and lose them for following leads beyond what Holmes has used, you grapple with what leads to prioritize. If there are three possible clues, what you choose to do can make or break your solution. When you are playing to win this can also cause a large amount of frustration. Some clues are intentional red herrings that will lead you off the right path, and if that was the lead you chose to follow you may be back to square one in no time. It is possible to beat Holmes, but you will find that most of the time you will “lose”. This however, doesn’t spoil a fantastic and riveting experience. I find that the less I worry about trying to win, the more enjoyable the whole thing becomes. Cases just waiting to be solved! The cases themselves are incredibly well written. Each is like a story unto itself, and the clue points that you follow integrate perfectly with the stories that are woven as you race through London. You have to read these cases, find relevant information in the copies of the London Times you are provided, identify suspects and witnesses, piece together the riddles using logic, deduction and astute observation. This may feel like work to some, as there is a lot of reading, note taking (this is very important as there is a lot of information that you need to keep track of) and thinking. However, there is also a lot of humor interspersed that keeps everything on the lighter side. There was a point in one case, where the lead led us to someone who didn’t understand English. The outcome of this particular lead was us deciding that we could repeat ourselves a thousand times without getting anywhere and we retreated to the nearest pub. We couldn’t help but laugh at this and could see ourselves backing away from the gentleman and deciding to regroup over a pint! 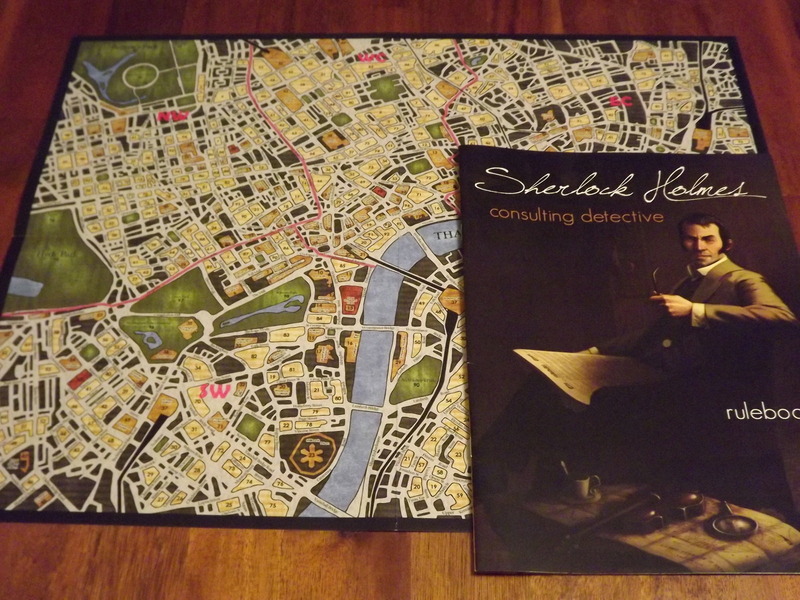 Holmes’s London….Can you beat the master?! One thing that I noticed is that the game does end rather abruptly. When you make the decision to stop following clues and try to solve the case, there is no decline, the game just ends. The nice thing about this though, is that you dictate when this point happens. If you are trying to edge out a victory, then this should be with as few clue points as possible, but if you are in it for the experience then this can involve as many as you wish. Sometimes it is nice to follow up on some of the not so important leads that may peak your interest. Once the choice has been made you then get to answer two sets of questions. One set pertains to the murder and the other to the extraneous details you may have uncovered throughout your investigation. Points are awarded and then you get to see how Holmes solved it and compare. I find this is the best part of the game as you actually learn from the great detective himself and follow his deductions. I use the information that I have learned during this point for the next case of the game, making each time I play more interesting and intricate than the last. Although an excellent experience, this game does have a finite amount of plays in it. It comes with 10 cases, and once solved they are not very re-playable. But if you have a poor memory, or are able to go years between playing a case, then this complaint may be overcome. There is also a way for you to score the game without knowing how Holmes solved it. All you need to do is have another person (who will never play the game) score your results for you, leaving you to play again to improve. Whatever you do, for the price of the game, the hours of entertainment you will get makes it more than worth it. There are also case expansions that are out of print at this point, but they would also give the game a bit more replay value. 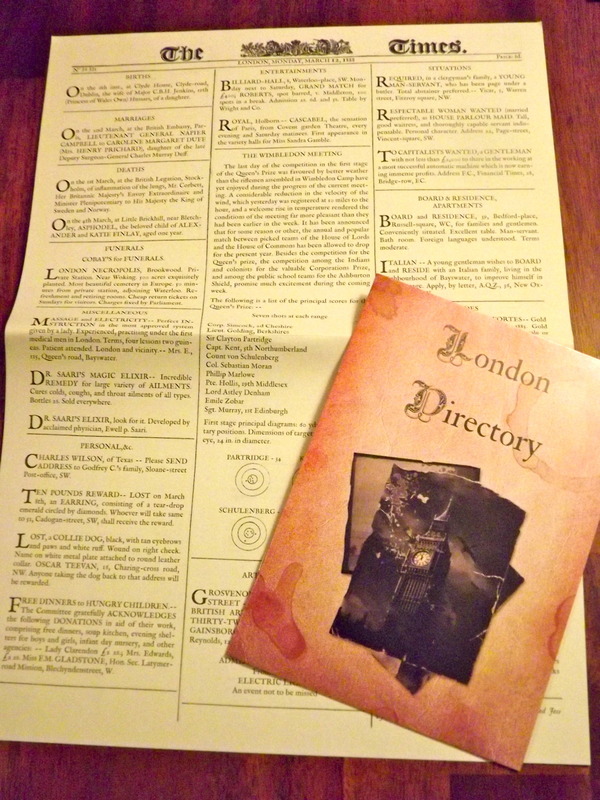 The London Times and The Directory, all you need to solve a case if you are clever. The components to the game are minimal. You get a rule book, a directory, a map of London, the 10 case books and the corresponding newspapers. There are no dice, no cards and no miniatures that are usually associated with board games. However, the items you do get are beautiful. The newspapers themselves are chock full of 19th century articles, obituaries, columns and advertisements. 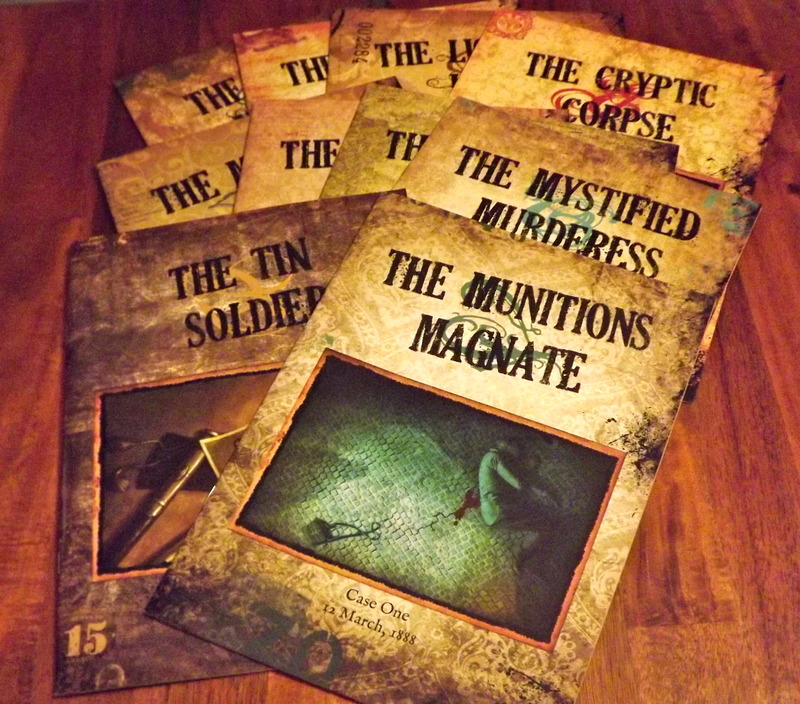 These may include clues that will help with the case, but they look like real newspapers, so they benefit the immersion and atmosphere of the game. The artwork throughout the books is also amazingly well done. It makes you feel as though you are actually in London at the time of Sherlock Holmes. The font and size of the print for the case studies are a bit on the small and unusual side, and this may be hard to read for some. With the amount of reading that you have to do, this could be a bigger issue than I found it to be. I adore Sherlock Holmes. I have been reading his stories as far back as I can remember and grew up watching Jeremy Brett playing the famous consulting detective on TV. I always tried to use his way of deducing the culprit and avoiding twisting the facts to suit my theories, instead of coming up with the theories to suit the facts. So having a game where I could match wits with the master himself was a dream come true. The experience that this games leaves you with is one you will remember; the cases are like novels and the components are perfectly integrated with the theme. You truly feel as though you are sitting in 221B Baker Street and trying to catch a criminal from your armchair in front of a fire. Great review. I remember that this game originally came out in the 1980s. I got it as a gift, but I wasn’t much of a gamer and didn’t really have anyone to play it with. I remember being simulta60 neously fascinating at the depth of materials with the game and overwhelmed about how to play. Now I think I’d like to give it a try. This is a great review and I’ve seen some other reviews say it works best with 2-3 people (max) who work together as a team, enjoying the detective-work, rather than competitively against each other. … At 60 to 90 minutes per game, with 10 scenarios, that’s a plenty of hours of great game play, in my mind. This is an old-fashioned game now. No electronic bells and whistles or fancy scoring system and rules. Just enjoy it for the literary and mind-challenging aspects. Something to play around the table on a rainy, quiet night, with all the devices and TVs and noise-makers turned off. I have started a campaign on kickstarter to develop an online version of this game, allowing players to become writers of new stories, adding their own maps and compare scores with other players. I leave the link below.